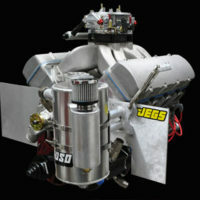 Johnson puts a check mark on that fallacy and points to the success of Chevrolet's ultra high performance COPO Camaro drag racing packages all of which are equipped with Johnson hydraulic roller lifters. Chevrolet's choice of Johnson Lifters is no dart board fantasy. Johnson was selected because of its reputation for precision high quality assemblies that routinely perform as specified. To ensure that type of quality performance Johnson follows a strict regimen that addresses all the manufacturing and usage concerns associated with hydraulic roller lifters. A number of years ago, Chrysler was having trouble with the hydraulic lifters in their Viper engines. The lifters would frequently stick and the problem became so bad that specialty shops like Arrow Racing began bushing the blocks and installing smaller GM LS lifters as a remedy. 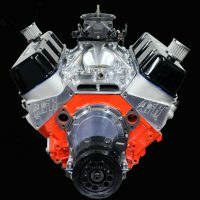 Johnson stepped in, identified the cause and revised the .904 Chrysler lifters to cure it; thus furthering their reputation for quality and excellence in engineering within the OEM market. Hydraulic lifters are in fact precision engine components that function with very minute clearances. They are designed to maintain zero lash clearance. 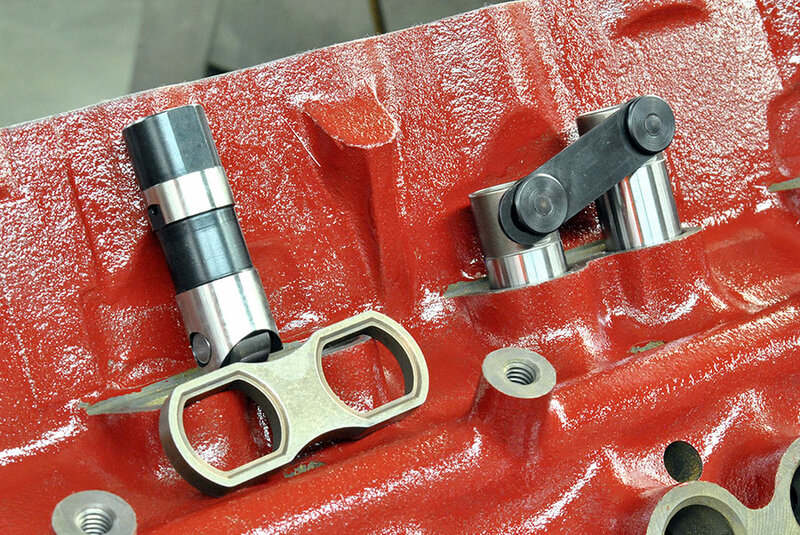 Where solid lifters require a slight clearance or valve lash between the valve and the rocker arm or cam follower, hydraulic lifters eliminate that clearance and provide more precise valve control, silent operation and reduced wear characteristics. Mechanical lifters (solid) require valve lash clearance to adjust for thermal expansion. Hydraulic lifters are comprised of a precision steel cylinder fitted with an internal piston. A stout spring keeps the piston at the outer limit of its travel. Pressurized oil is supplied to each lifter through a small hole fed by the pressurized lifter gallery. When the valve is closed the lifter fills with oil. 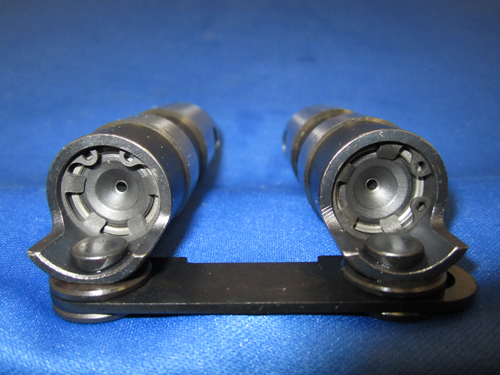 When the camshaft lobe begins the lift phase it compresses the piston which shuts the oil inlet. Since oil is incompressible this greater pressure make the lifter effectively solid during the lift phase. As the camshaft lobe travels through its apex, the load is reduced on the lifter plunger, and the internal spring returns the piston to its neutral state so the lifter can refill with oil. This small range of travel in the lifter's piston is enough to allow the elimination of the constant lash adjustment. Hydraulic roller lifters are common to all modern pushrod engines. They offer quiet, trouble free operation with reduced friction and valvetrain stress, but they are not however, without their own unique quirks that require innovative solutions. That’s where Johnson Lifters shines brightest. They identify and solve common lifter problems to ensure optimum performance and reliability. While similar in appearance and function, hydraulic and mechanical roller lifters each endure the same forces acting to inhibit their performance. A common issue with mechanical roller lifters is the impact loading on the tiny roller bearings during each valve cycle. One or more of the small rollers takes a pounding every cycle and over time they take quite a beating. This is caused by valve lash clearance that slams the rollers during each cycle. 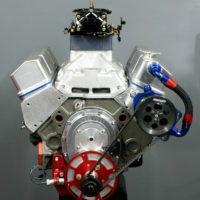 The problem plagues some race engines with excessive spring pressure too, but race engines have far fewer cycles than a hot street engine. Mechanical roller lifters on the street often suffer greater distress than race engines because racing lifters are more frequently examined and replaced if necessary. Hydraulic roller lifters also have needle bearing rollers, but they are not subject to severe impact loads like a mechanical lifter because the valvetrain has preload and there is no clearance to be taken up. 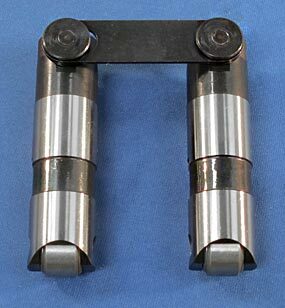 Hydraulic roller lifters are often criticized for not being able to handle the higher spring pressure required for high rpm operation. In a production lifter, high rpm spring pressure plus inertia loading depresses the piston in the lifter resulting in less valve lift. Depending on the amount of preload and the rocker ratio this can result in a valve lift loss of .050-.075-inch, depriving the engine of its design spec airflow window and making the cam perform poorly. Excessive lifter bleed down caused by improper piston –to-bore clearance within the lifter is the root cause of what we call lifter pump down. 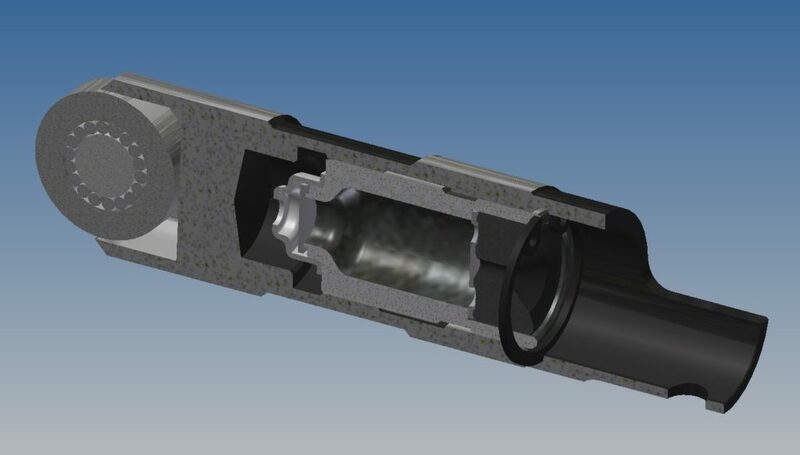 The cure for this is tightly controlled clearances within the lifter body and a superior valve design that supports faster refilling of the internal oil cavity. Lifter pump up is another troublesome issue that occurs at elevated rpm. This occurs because the spring loses control of the valve due to inadequate spring pressure, flexible pushrods or heavy valve train components. When this happens separation between the components occurs and oil pressure forces the internal piston up against the retaining clip at the top of the lifter. It causes the lifter to hold the valve open by some amount that is typically enough to cause damage; again, the tiny rollers being slammed with excessive loading. Factory preload specs commonly compress the lifter plunger by 1 to 1-1/2 turns after zero lash. With a 24- thread-per-inch rocker stud, a full turn provides about 0.040 inch of preload. A turn and a half equals about .060-inch. Most factory lifters have a plunger travel range of about .120-inch. So a turn and a half of preload places the lifter plunger approximately in the middle of the total available travel. This leaves up to .060-inch available to hold the valve open if the lifter pumps up. Reducing the preload to 1/4-turn (0.010 to 0.015 inch) reduces preload travel and is usually enough to prevent lifter pump up from holding a valve open. Severe lifter pump up can sometimes hold the valve open far enough to incur valve to piston damage. A common drag racing trick depresses the lifter plunger almost all the way to the bottom of the available travel (.020- .030 -inch) with up to two or more turns of the adjuster nut. This is done to combat lifter pump down due to high spring pressure. It forces the lifter to function almost like a solid lifter. It eliminates the possibility of compression due to aerated oil. This problem often caused drag racers to lose power because the lifter does not provide the full specified amount of valve lift. By eliminating oil cavity compression the lifter is able to transfer the full amount of valve lift as specified by the cam designer. Another means of combating these issues was the introduction of short travel hydraulic lifters built with a shorter range of travel for the internal piston. Travel distance is only about half that of a production lifter and thus limits the potential for lifter piston pump down. The smaller travel permits a very limited range of movement for air entrapment and pump up to occur when valve float is encountered. Short travel lifters permit the use of higher valve spring pressures with hydraulic roller lifters. 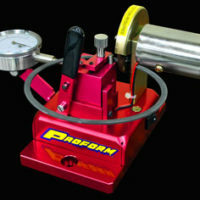 They are most effective when applied with the traditional 1/4-turn down adjustment to further limit the travel range. To solve many of these common lifter issues Johnson Lifters maintains phenomenal control of lifter piston-to-bore clearances. This precisely controls the lifter bleed down rate and is further supported by a proprietary design that refills the oil chamber faster. Lifter bore clearance is measured in microns, a fancy term meaning you can’t see the clearance but it’s really there. One micron is 0.0000393-inch and while they’re not saying how many microns makes a stable lifter, they do know what that figure is and how to maintain it. Part of that control comes from the lifter bore finish and how it’s obtained and part comes from skilled assembly. Johnson adheres to both rather religiously. Tight tolerances are rigorously maintained and only very experienced technicians assemble the lifters. While some manufacturers employ general street labor, it takes on average about eight years on the job before an assembler can build Johnson lifters without close supervision. The results speak for themselves as Johnson lifters easily handle seat pressures exceeding 300 pounds and up to 800 pounds plus over the nose of the cam. Spring pressure is an enemy to all lifters, particularly hydraulic lifters. While serving as a linear motion transfer mechanism for the valvetrain, the lifter also functions as a precision shock absorber so that metal parts are not exposed to repeated high stress contact. Like mechanical rollers, hydraulic rollers gain performance and durability with lower spring pressures. 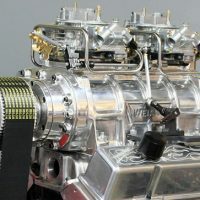 They also favor lighter valvetrain components, shorter stiffer pushrods to minimize deflection and stable rocker assemblies that promote smooth operation. The uses of stiffer, lighter valvetrain components cannot be overstated. 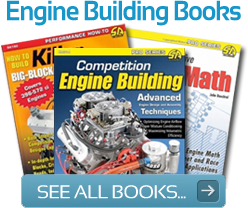 Valvetrain designers pay close attention to the moment of inertia required to activate the rocker arm and the component stiffness necessary to transfer cam motion accurately. Likewise, titanium retainers offer greater control for a little recognized reason. The top half of the spring travels a much greater distance than the bottom half and that’s where control problems and spring surge initiate. A lighter retainer minimizes the force the spring has to control allowing it to function more effectively. Another critical consideration is oil viscosity. Heavier oils tend to resist hydraulic lifter function even though it seems as if they would provide a superior hydraulic cushion. The oil must be able to hold pressure with tight internal lifter clearances and navigate the passage in the refill valve effectively to maintain control of the internal piston. Johnson reps also stress the importance of clean engine oil for satisfactory hydraulic lifter operation. With clearances measured in microns, it is easy to compromise lifter function with dirty oil. 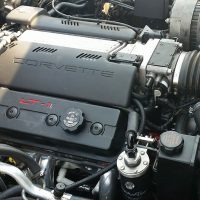 Regular oil and filter changes are critical and they also note that the common practice of soaking lifters in engine oil prior to installation can actually cause problems. That's because the common practice is to place them in an oil bath that is not covered. All the microscopic pieces of lint, dust and other contaminants floating around in the air settle onto the oil surface and find their way into the lifters. 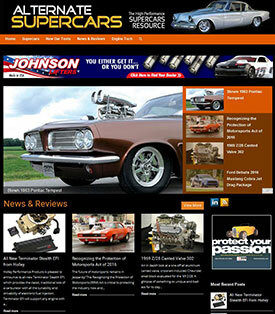 Johnson has found that dirty lifters are by far the most common cause of lifter issues. of the valve causing a float condition where the fluctuating clearance allows the internal chamber to fill completely and hold the piston against the snap ring lock. When this occurs, the lifter preload can hold the valve open by .050-inch or more. High spring pressure and inertia loading depress the piston too far resulting in a loss of total valve lift and reduced performance. When a tuner adjusts the valve to a minimum preload it reduces the travel before the lifter pumps up. It’s almost solid with just enough preload to maintain hydraulic function. This is a much favored tuning tactic, but it does not always provide optimum performance. 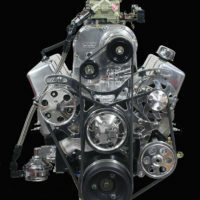 It generally provides a few hundred more rpm but with harsher valve action. 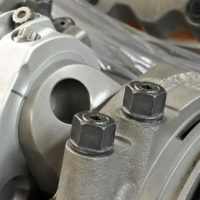 Three quarters to one turn down on the adjuster nut often provides a performance gain because the smoother action maintains good control of the valve. And with less oil in the pressure cavity piston travel is reduced and it is easier to rapidly refill the chamber on each cycle. Considerable performance potential occurs within the very narrow window of hydraulic lifter operation. It allows some hydraulic lifter equipped engines to approach mechanical lifter performance depending on the application. 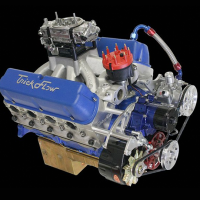 As much as you rely on camshaft and cylinder head design to provide optimum efficiency and airflow, you must also rely on precision lifters to reliably transfer the cam designer's specs to the valve train to ensure maximum performance. 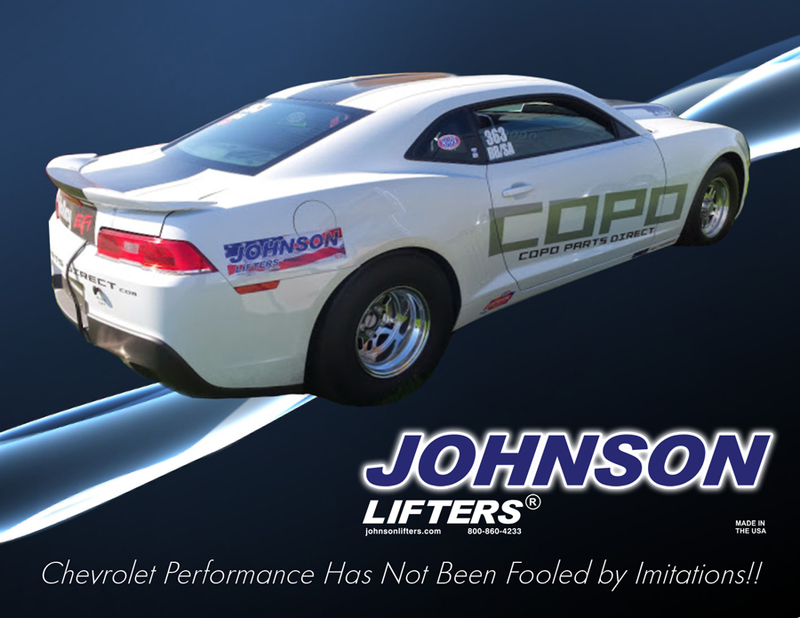 Valve lifters are often an afterthought in performance engine builds, but Johnson Lifters is on a mission to make certain you get all the performance you have coming from your race or high performance street engine.